supper and then bowling with our families, sometimes III Minnedosa and sometimes at Sportsman's Park. In 1989, we held our first family potluck supper at the Perky Pioneer Centre, at Christmas time, and that custom has continued until today. In 1990, our June outing was a trip to visit the Margaret Laurence House in Neepawa. It seemed as a club our bowling days were over. We also had June outings to the Sandy Lake Museums, The Rapid City Museums, The Daly House Museum III Brandon, The Agricultural Research Station in Brandon, and the Lily Festival in Neepawa, where some of the ladies appeared on CKX-TY. We also began to have fall outings in the 90's with meetings being held at Lake Catherine, Clear Lake, Erickson Camp Ground and the Rolling River Band Office. In 1994, the Women's Institute decided to renovate the Perky Pioneer Centre and call it the Crossroads Community Center. Our Club agreed to support this proj­ ect with a pledge of $300.00. Bake sales had lost their appeal for Club members since the Personal Care Home days ofthe 80's; so, it was decided to have a soup and sand­ wich lunch instead. This was successful in raising the required money. At this time, a motion was passed to continue to make donations to local causes but to discon­ tinue donating to outside organizations (Heart, Lung, Cancer, etc.) as it was felt that members give to these outside organizations privately if they wish. Some of the local causes we donated to were families whose children had surgery out of town and families who have had house fires, as well as such local projects as the Handivan, the Library, the Jaws of Life, the Girl Guides and the W.I. Country Fair. Elva Sundmark; Phoning Committee, Mabel Hillstrand and Edna Sjoberg; Auditor, Winnifred Whitaker. Susan Woywada, Margaret Eden, Edna Sjoberg, Selma Skoglund, Fran Pengelly, Anna Wark, Mabel Hil/strand, Emily Sillen, Win Whitaker, Mary Skogstad and Freda Clow. Since 1984, the Perky Pioneers had been dwindling. Therefore, all the fun and trips, etc. slid out of the picture. We had only one trip in the seven years I belonged. We served noon lunches to the Chamber of Commerce and the Manitoba Pool. We always had a Christmas party and a meal out where each paid for his or her own. Due to lack of interest, aging and health, we were unable to look after the place. We put out a cry for help and, as there seemed to be none available, we were forced to close. We could not sell the hall but could give it to another organization that was willing to help the commu­ nity with a meeting place for small events. We saw a lawyer who advised us to put it in the hands of the Village and let them find someone. We then cleared up all our debts and gave the money that was left to the Skating Rink, for school sports and Service for Seniors. The Perky Pioneers of Erickson closed in August 1994. 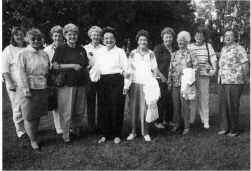 'The Retreads' was the brainchild of Edith Earley who, back in October 1990, suggested that there be a group of ladies who would get together occasionally. From a coffee party with a few friends, the theme of the Retreads was to 'get together' for fun and community betterment. For community betterment, an enormous task was launched - to introduce a recycling program to Erickson. With the assistance and co-operation of RMNP, this was successfully accomplished.